In June 2014, a terrorist group calling itself the Islamic State of Iraq and the Sham also known as ISIS conquered the city of Mosul. They displaced Christians, enslaved Yazidis, killed Shia and Sunnis alike. Life in Mosul came to a halt. More than 9,000 Yazidi women were enslaved and more than 500 women were publicly executed in the streets of the city on multiple charges. 2,000 women from around the world joined ISIS. During the battle to retake the city from ISIS, more than 3,500 women were left behind. They are mothers, sisters, daughters and wives of ISIS fighters. They are living in isolated camps facing collective punishment for crimes they didn't commit. More than 3,000 Yazidi womens fates are still unknown. 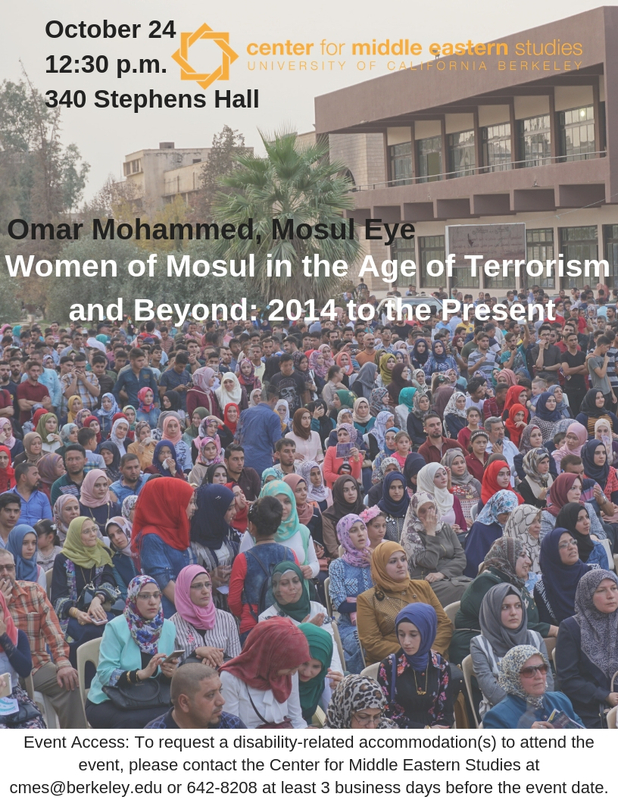 This lecture aims to discuss the situation of the women of Mosul under the rule of ISIS and the current Post-ISIS period. Omar Mohammed a native of Mosul, Iraq, was present when the Islamic State (or ISIS) forces occupied the city in June 2014. He had been teaching history at the University of Mosul and decided that, for the sake of future historians, he would record the Islamic States activities, including the destruction of local monuments, persecution of religious minorities, execution of political dissidents, and other atrocities, at the risk of his own life. These reports were published in English and Arabic in an anonymous blog called the Mosul Eye. As a historian and lecturer at the University of Mosul, he focuses his scholarly work on conceptual history and research dealing with local historiographies and narratives, micro histories and Orientalism. Omar is a regular media commentator on Iraq, has an MA in Middle East History from the University of Mosul, and was named 2013 Researcher of the Year by Iraqs Ministry of Higher Education and Scientific Research. His doctoral research explores history and historians in 19th and 20th century Mosul. He now lives in exile in Europe.